“The era of revealed miracles ends with Purim. ‘But what about Chanukha?’” [TB Yoma 29a]. 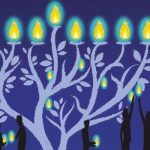 R. Tsadok explains that the essential miracle of Chanukha, the miracle of lights, was not visible to the world. No one saw it but us, and you had to be an insider to appreciate the significance of it. And really, what kind of miracle was it? We could have lit the menorah with contaminated oil, or delayed the kindling for a week until we produced a new batch. What practical difference did it make? The essence of the miracle was the quiet affirmation of relationship between HaShem and His beloved people packaged in a form that only we would appreciate. And it is interesting that the Talmud depicts the pre-Purim period of revealed miracles as a time of Divine concealment called night.2 Purim marks the cusp and Chanukha heralds a new age of subliminal miracles, which it equates with daylight and Divine presence. The implications are strange but clear: revealed miracles conceal G-d and concealed miracles reveal G-d. How can that be? A parallel teaching serves to illuminate. HaShem’s four-letter name conveys the totality of Divine expression. The first two letters (yud and hei) mark the concealed realms—those aspects of G-d that are presently beyond human awareness. The second two letters, vav and hei, denote the revealed realms—those aspects of G-d that we know and enjoy. Kabbala explains that these four letters are grouped into pairs which function as couples (so to speak), each party holding a different mode of Divine expression, one masculine and one feminine (mashpia and mekabel). Gender permeates all aspects of HaShem’s creation. Starting from below to above, the lower two letters (vav and hei) are called man and women by kabbala. 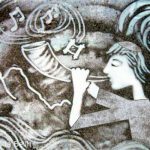 As cosmic archetypes they express the polarities of male and female in their prime, where the nida cycle applies, and there is a constant dance of merging and differentiating, closeness and separation. Yet, it’s an immature stage of development because we need drama to maintain our interest—absence, to make our heart grow fonder. And it applies to our relationship with Hashem as well. We fall, forget, transgress or regress and then cry, repent and beg for forgiveness. Here too, it’s the alternation of turmoil and exhilaration that keeps us engaged. Conversely, the upper two letters (yud and he) are called father and mother but they are actually more like post-nida grandparents for kabbala describes their relationship as “two beloveds that never part.” They do not need the tumult of separation and reconciliation to maintain their interest. Their hearts glow with quiet affection as their relationship steadily deepens without need of stormy fervor to keep their hearts engaged. There’s nostalgia for the days of fiery passion but their newly realized inner peace far outweighs the loss. Now miracles are dramatic. They jolt us from complacency; they pluck us at the last minute from what seemed like certain death. The era of miracles with its highs and lows—terrors and elations—is intoxicating, but in the end, we fixate on the doings of Hashem. We rarely share a quiet moment of just being with our Maker, and the intimacy of core to core that happens in the stillness. In that sense, revealed miracles conceal HaShem by diverting our attention to the surface. And concealed miracles reveal HaShem by fostering the calm that invites a deeper encounter. And this explains the debate between Hillel and Shammai about how to celebrate our whispered miracle of Chanukha lights. How do we memorialize that loving communiqué in a way that honors its intention? Hillel’s solution addresses the reality of who we are now, in our immaturity, with our penchant for drama, signs and wonders. The bigger the miracle the greater its power to rouse us from slumber, despair, and exhaustion. Each day that the oil miraculously burned the more we trusted HaShem’s devotion to us and concern for our needs. The more lights, the more wonder, the more love. 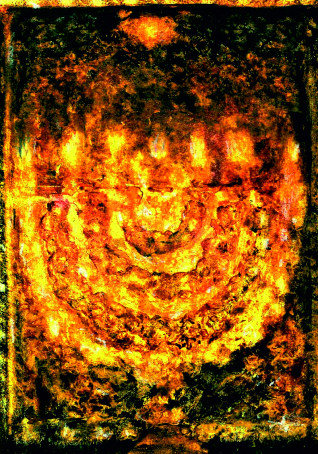 Shammai’s solution commemorates the eternally-enduring truth of our relationship with HaShem in its seasoned maturity—an exquisitely quiet joy distinguished by its stable nature and expressed by a single flame. At the higher rungs of a spiritual path we must relinquish our need for drama, miracles and pyrotechnics to motivate our forward growth. And this is the message that Shammai seeks to impress on our soul—the big picture and higher possibilities of relationship. The less lights, the less drama (including miracles), the less that distracts us from the intimacy of stillness-touching-stillness that will delight us for eternity. The rabbis ruled that Hillel’s model is the message we need in our present state, beleaguered by exile and a limited attention span. But in the messianic time, our calling will be different, and Shammai’s model will apply. The comparison of Shammai’s model to the bulls on Sukkot, is true but it is hard to explicate because beasts associate with corporeality and by extension to things that conceal G-d. And so it makes sense that progress be marked by their diminishment—representing the gradual elimination of all that conceals G-d and opposes spirit. But lights stir the soul. The eight lights are beautiful and uplifting (whether they come on the first day or the eighth). It doesn’t feel right to equate them with beasts and bullocks and corporeality. Yet, that is what the Talmud says. 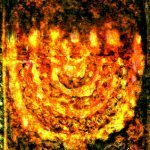 This is an attempt to stay true to the Talmudic teaching, but to present a more subtle interpretation of those bullocks as they apply to the lights of Chanukha. Zohar 3:4a; Emek HaMelek, shaar 13, chapt. 6; Gra’s commentary on Sifra d’Tsniuta chapt. 1. In the piece upon which this is based, R. Tsadok identifies our personal communications with HaShem with our special chalek in the Torah sh’baal Peh (oral Torah).